Plate fifty-one from the second volume of James Forbes' "Oriental Memoirs". Forbes(1749-1819) was made Collector of Bharuch in the late 1770s. A keen observer, he would fill his letters to friends and family with descriptions of native inhabitants and their 'manners and customs', such as this one. 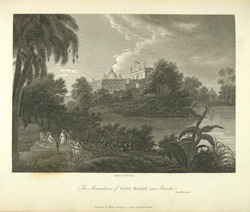 Describing this as a 'moving scene after sunrise', Forbes wrote: 'the Mohammedan women, on the anniversary of the death of a husband, child or relative, strewing the grove with...fragrant flowers; at the approach of night they place a few lamps around the tomb, and pass the hours in the melancholy pleasure of tender recollection.' Nests of the Bottle-nested Sparrow may be seen hanging from the branches of the Cocoa-nut tree.